The Horizontal LED Open Signs are lightweight and easy to hang from any window in your store. This sign guides customers to your business and is bright enough to see in broad daylight. The sign offers several lighting options and combinations to switch from. This specific sign is 20”W x 7.5”H and plugs into an ordinary 110v receptacle. Additional Information: Power Consumption : 3.5W, Bulb Lifespan : 30,000 hours, 6ft Power Cord, Weight : 2lbs. I have people commenting on the sign, how it caught their eye. 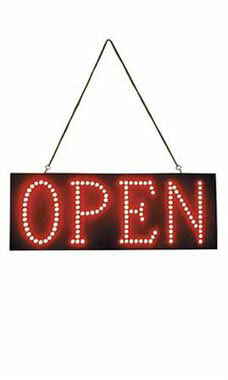 I love my new "OPEN" sign. People were having trouble knowing if my shop was open, and now there is no question. I also love that it's different than most of the signs nearby. The "OPEN" sign was money well spent! It is well made and eye-catching. Even our 11 year old grandson loves it! This is very simple and unique. The sign fit perfectly in my store window and I love the option to change between flashing or static lighting. Would have given it a 5, but the power outlet prongs get pushed into the power box, making it difficult for the power box to stay plugged into the outlet.